View of fields and trees at Landwade, Cambridgeshire. 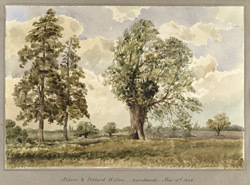 The tree is a Pollard Willow and to the left are two alder trees . Landwade is an ancient manor on the border between Suffolk and Cambridgeshire, about 4 miles north of Newmarket. The manorial estate had for centuries had been owned by the Cotton family. John Chessel Buckler, who was an architect as well as a topographical artist, was employed to redesign the manor house, and during his time here in April and May 1848, he took a number of views of the estate.